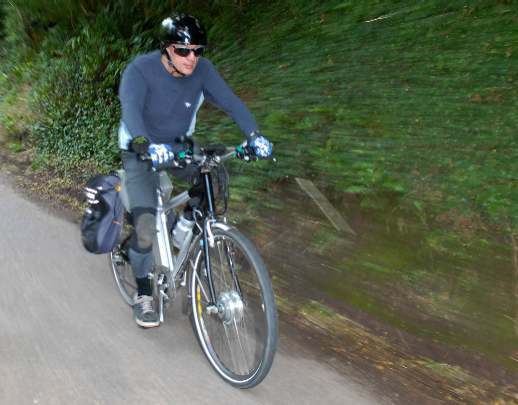 "As if riding an electric bicycle over Exmoor wasn’t eccentric enough, I was supposed to perform feats of mental arithmetic at the same time"
There is a standard conversation that e-bikers have. Someone will say, “Wow, that’s a smart looking bike”. E-biker will then mention some distant place he has just come from. “Wow, that’s really impressive, you’ve ridden all that way?” The e-biker is then out of modesty compelled to point out the motor and the battery. The member of the public has spotted them of course, but not really connected them up; they don’t necessarily look the part and he is wondering if they are fancy modern bicycle accessories. The next line in the conversation is always “Oh, that’s cheating.” We get a wry smile out of it every time, because the person accusing us of cheating has just got out of a motor car. Think about it – which one of us is really using an artificial aid to replace leg power?